Hareidi MK Uri Maklev says a divided coalition cannot function, presents a selection of quotes to prove his point. 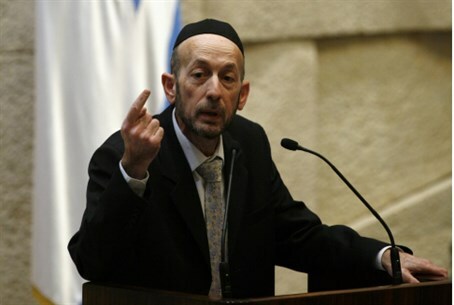 MK Uri Maklev of the hareidi United Torah Judaism party harshly criticized the coalition on Monday. Speaking during a discussion on a non-confidence motion brought forward by the opposition, Maklev said that the coalition was unable to function properly because of all the internal disagreements between its members. "A government that is crumbled and crushed from the inside cannot be relied on to decide neither on domestic issues nor on foreign issues, not on economic issues, not on political matters and certainly not on security-related issues," he said. “It’s scary to think that this is how a coalition behaves when the decisions it needs to make are serious and have a significant impact both in the short term and the long term,” he said. To illustrate his point, MK Maklev brought a selection of quotes that show the deep polarization between the members of the coalition. "Bennett , the minister that Lapid announced is no longer ‘a brother’, says that ‘Yesh Atid is a dictatorship and it's no secret.' Liberman tells Bennett that ‘the unity of the people is more important than the unity of Judea and Samaria, and Bennett responds by saying that ‘Liberman is zigzagging and is passing Livni on the left,’” said Maklev. “Bennett accused Netanyahu of a ‘loss of values’​​, Netanyahu warned Bennett that if he is unhappy he is welcome to resign, and the latter was quick to apologize," continued Maklev. "Steinitz accused Lapid of behaving irresponsibly and causing substantial damage to the Israeli economy, of being cocky and arrogant and of thinking he deserves everything. Defense Minister Ya’alon attacks Erdan and says that ‘the Home Front Defense Ministry is waste of public funds’, and Erdan responds by saying that the Defense Ministry hurts the home front,” he added.